Ms Winnie Chiu, President and Executive Director of Dorsett Hospitality International was awarded the coveted Women of Hope Global Champion Award. This prestigious award, based on open voting by members of the public was accorded in recognition of Winnie’s outstanding work and endeavours in putting Hong Kong on the map; and her many achievements in various fields. The Women of Hope Awards was established in 2014 to recognize influential women in Hong Kong who champion the call for justice for women, children, and the community, as well as ladies who continue to astound Hong Kong with their ability create, inspire and offer hope. 36 women, across 8 categories, from eco-warriors to charity workers, entrepreneurs to equality champions, the Hong Kong Adventist Hospital Foundation and Tatler honors inspirational women in Hong Kong with the Women of Hope. “Being honoured with the 2016 Women of Hope Global Champion award is indeed a huge encouragement and endorsement; this represents recognition from people from all walks of life who believe in what I do. With this trust and confidence I will continue to pursue my passion in giving back to the society especially in education and; arts and culture as well as promote Hong Kong. Asia’s World City, a city that is bursting with an energy that never fails to exhilarate visitors and offers unparalleled business opportunities especially with the "one belt; one road" initiative ; this city that taught me everything, where I grew up and I love from the bottom of my heart into the global arena and to serve as an inspiration to women around me. To those who have voted for me; thank you so much for believing in me. It is your unspoken support and trust that fuelled my passion to serve our society and of course a big Thank You to Hong Kong Adventist Hospital Foundation for the tremendous honour. I am indeed humbled by the honour bestowed upon me,” said Winnie on being accorded this coveted award. 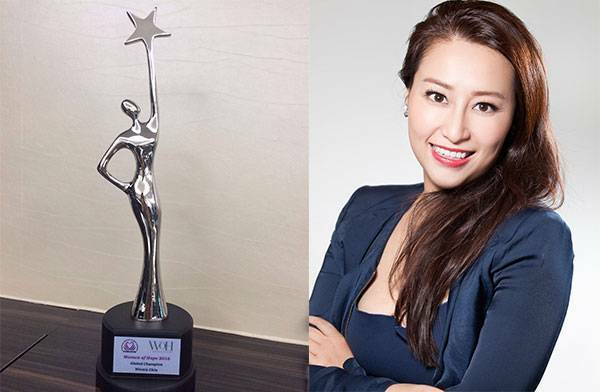 In 2014, Winnie was included in Forbes Asia 2014: Top 12 Asia’s Power Businesswomen To Watch List and was accorded the 2014 Hong Kong Professional Elite Ladies Award.